The race between Yanga and Thato came to a dazzling conclusion tonight when 17-year-old Yanga snatched victory to become South Africa's next superstar. Mzansi collectively held its breath as millions of eyeballs trained on host Proverb, crossing fingers for their favourite to be named the SA Idols Season 14 winner. Yanga, who becomes the second consecutive teenage girl from the Western Cape to win the title after last year's Paxton, becomes an instant millionaire thanks to a staggeringly awesome prize package that includes a record deal, car and a myriad of other glamorous prizes. "I can't put into words how I feel right now, but I can say it in song," said a shell-shocked Yanga a few seconds after her name was called, before bursting into a gratitude chorus. The show pulled out all the stops to bring Mzansi Magic viewers and the full house at Carnival City's Big Top Arena a music spectacular. There were pyrotechnics, motorbikes, a jungle feel, protests, a riot of colour and a glimpse of an Africa reimagined. The performer roster read like the who's who on the hot list, kicking off with an Afro-futuristic group performance by this season's Top 10, host Proverb and judges Randall, Somizi and Unathi singing Greatest Show and Never Enough. Last season's victor, Paxton, served sass with her spicy single, Angifuni, which has been blowing up on YouTube with over a million views and counting. 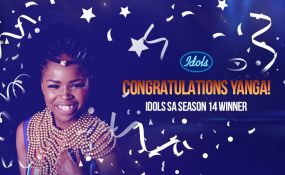 Director and Executive Producer, [sic] Entertainment Gavin Wratten, said: "Idols SA season 14 has beaten all our expectations; surpassing a 100 million votes is a landmark achievement for reality TV in this country."